Not one, but two international series in June were marred by something as simple as trying to claim a high ball. First, French winger Benjamin Fall received a red card after it was judged he had caused Beauden Barrett’s ugly fall 12 minutes into the All Blacks’ 26-13 win. The contest was immediately killed. The red card was later rescinded after it was deemed that Anton Lienert-Brown had run into Fall, aggravating Barrett’s fall. 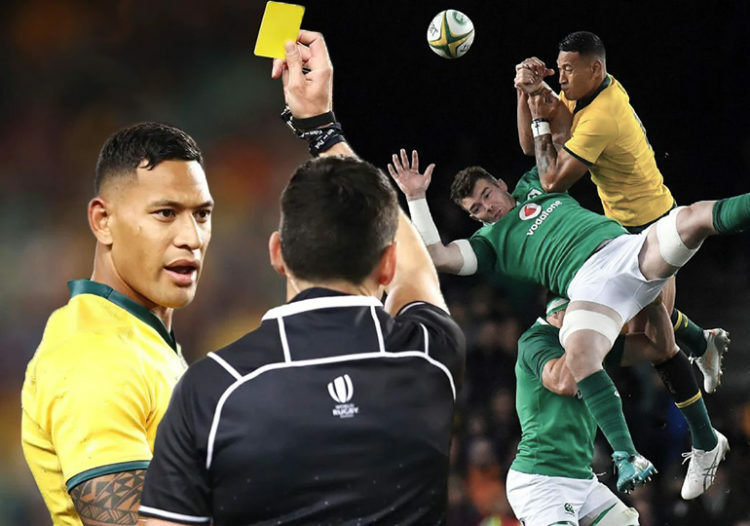 One week later, in the deciding Test of a pulsating series between Australia and Ireland, Wallabies superstar, and high-ball specialist, Israel Folau was yellow-carded after he contested a ball from kick-off, which resulted in Irish flanker Peter O’Mahony crashing to earth. Folau was handed a one-week suspension, but of more influence on the Test match, the Aussies played for ten minutes without their best back and lost the decider 20-16. Two weeks in a row, an important result was determined by a player contesting a high-ball, without any intent whatsoever to cause any bodily harm to his opponent. Something doesn’t read right here, does it? Player safety is paramount, but penalising players and teams so heavily for what is effectively an accident is just plain daft. Livelihoods are affected, dreams smashed and the spectators pay the price all because players made an error in judging the timing of their jump. World Rugby is walking a dangerous tight-rope with these sanctions. Next thing you know, players will begin simulating dangerous falls in the hopes of winning the immediate dismissal of an opponent of Folau’s calibre. And don’t tell me players won’t do that – Neymar has been rolling around Russia for weeks in the hopes of getting players sent off. It makes it easier to win. An even bigger shame could be that players opt out of contesting kicks altogether, thus scrubbing another source of tries from kick-receipt or turnovers. Johan Roets and Chris Latham each made a living out of contesting high-balls. One has to wonder if they would still be as effective today. An error in judgement should not result in the contest being ruined with players ejected from matches. Perhaps World Rugby will consider trying to ban jumping. Aerial contests will take place from the ‘safety’ of the ground where chasers will be coached to line up the receiver for a monster ball-and-all tackle. Another option is to save the serious sanctions for after the match. If a player is impeded in the air, nothing more than award a penalty is awarded, with further sanctions left to the discretion of the citing commissioner. Or, trust the officials to interpret the laws correctly. Laws, unlike rules, leave room for interpretation and I’m sure people like Jaco Peyper and Angus Gardner are capable of earning their pay. It’s not necessary to immediately say “you are responsible for the player’s safety” and dish out a card every single weekend. Let’s see some interpretation – it can’t be too hard to have a discussion with two assistant referees and the video ref, and together decide if the player was being reckless, or if he just made a silly mistake. The bottom line is that something’s got to give. Rugby can’t afford to have blockbuster matches decided by unlucky jumping. Also, if a red card is shown, a different player should be allowed back on the pitch to prevent a one sided affair where a team plays most of the game with a player down. Good idea! Mike Tyson to start, break the oppositions star player’s jaw then we can replace him with a proper player. Replacing a red card negates the sanction that both the team and player must suffer. It is a team game and as such the team must suffer if a player does something contravening the laws. Don’t add another silly law to fix this one, either amend this law or scrap it and find other ways to make the game safer. Super rugby final 2017 too… Red card for Lions player Kwagga Smith. Jumping for the high ball is a relatively new thing that has only become more popular because the jumper gets an advantage and is protected, these days people are leaping 6 foot and more into the air because they know they wont be challenged most of the time, its only a matter of time before they start using each other as springboards to go even higher as it seems the criteria for deciding who could “realistically” win the ball is decided by who went highest. Remove the protection and people will stop doing it after they fall on their heads a few times,—-Darwin in action. If you still insist on jumping, intelligent teams will find ways of protecting the jumper by forming pods and supporting him. The paying public pays good money to see two teams of 15 play so perhaps that should be the way to go, a penalty on the spot takes care of the immediate transgression whilst the team gets penalized after the match by losing players for future contests in a judicial process where time is not of the essence and decisions are appeal-able. Red cards should be only for clear and intentional foul play that has caused injury. Far too sensible an option to ever be considered by World Rugby. In order to make the game safe rugby has to modify the pattern of play so that these instances don’t occur as often. The modern ball flies further and higher so the contests in the air more regularly. Changing the rules to modify the game is unprecedented. In the past a kick receiver could mark anywhere in the field. There was no 10m or 5m offside lines at lineouts and scrums. So the question is does rugby want to just increase the safety of the players. Or would a law modifying the way teams play be more acceptable. Banning jumping would be a sensible solution if we want to make the game safer. Physicality wont be reduced because the kick chaser can then either time his run to make the big hit or get their early enough to compete. This way there is the same contest but in a safer situation. Or a more radical solution, the pattern of kicking contestable kicks could be discouraged by amending the law to favour the defending side. This could be as simple as only the receiver/defender being able to jump for the ball. Or maybe an even more controversial solution would the for the offending player suffer the same result as the player that is taken out in the air. If the player is uninjured its a simple penalty. If the player has to go off for treatment or an HIA then the offending player has to leave the field for the same amount of time. The difference being that injured player can be replaced while the offending player cannot. Of course this would also be open to abuse. One thing i am 100% sure of is that replacing a red carded player cannot be allowed. Teams have to be punished for the transgressions of theirs players its a team game. It would be easy for a coach to pick a kamakazi player to injure the opponents star then simply replace him when the red card is issued. Yes this wouldnt happen often but in series deciders it would be a useful tactic. Personally I would like to see the contest for the ball. So the no jumping idea seems to be the best plan. Get rid of the box-kick. Its the main source of the problem, The All Blacks exploid it as a way to secure the game, because of the influence the Allblacks have on officials. The up and under needs to be done inside the opposition’s half. Jumping at any kickoff shouldn’t be allowed. I’ve been saying it for a few years now. Players are milking penalties with a card to go with it. As long as jumping goes on there is a risk of serious injury, card or no card. Lambie is a perfect example of a player who’s career was shattered. There was no intent from CJ who was contesting fairly within the current rule. I am convinced players exploit the tip tackle as well. It’s the easy thing to go over the top of a player who tackles low and drives through the tackle. Just make sure you don’t come down on your neck and you should be okay. Play dead for a while and the tackler gets an automatic red. Give it another few minutes on the ground and bobs your uncle. “There was no intent from CJ who was contesting fairly within the current rule.” – have a very good and long look at that CJ contesting the kick…..the ball has been kicked, from a distance Stander leaps into the air without any chance to collect the ball and clatters into Lambie with his hip to Lambie face. Not only a ‘late tackle/charge’ but reckless as well. Maybe no ‘intent’ to maime Lambie but surely he must be cognizant of the fact that his late charge could have a serious consequence? So why did he not just pull out of his charge…? Another problem I have is the intentional high jump, ala superman Barrett, who while in ‘flight’ leads with his one leg extended towards the tackler and he is also jumping forward at full tilt, just ask Kwagga Smith. Why not ban jumping altogether. If a defending player can’t get under the ball then he and the first opposition player can equally contest for the ball on the ground or on the bounce. Maybe also increase the ‘mark’ area to the halfway line to discourage teams from overdoing the box kick or up and under’s and in so doing force teams to keep ball in hand which is after all what the game is all about. Also this idea that a player must be badly hurt to get a red card is rubbish. Some players in my opinion, Barrett comes to mind, soar into the air and when they tumble earthwards decide in that split second how badly they need to fall to get a red card dished out. Reminiscent of the soccer ‘divers’. If the jumping law is not scrapped then every contact with a player in the air should be sanctioned in the same way irrespective of the ‘damage’ factor. The best solution is to ban jumping alltogether and allow ‘marking’ in your own half. Finally the sending off problem. If a red card is awarded and the severity of the sanction is questionable ( intent or not ?) then the guilty player is sent to the sidelines and replaced by another. It should therefore not be a red but say a white card. The TMO’s ( maybe two or three ) then scrutinize the event and decide on a suitable sanction while play continues. This will then avoid these drawn out discussions etc. If the player is cleared he may then return to the field. If not an appropriate punishment can then be meted out immediately or later if deemed serious enough. The replacement will stay on the field leaving 15 vs 15 players. Cheers.